What Happens in a Fresh Hope for Mental Health Group Meeting? You will be in the company of peers who experience similar experiences with mental health. Fresh Hope is a safe place. What is shared in a Fresh Hope meeting is confidential. You will not be judged, reprimanded, or condemned. You’ll see we’re a group who looks confidently to the Lord. Anyone who now or has had a mental health challenge, including anxiety and panic disorders, bipolar disorder, schizo-affective disorder, schizophrenia, PTSD, as well as depression, and other diagnosable conditions, may attend Fresh Hope. The loved ones, family members and/or friends of those who have a mental health diagnosis may also become part of a Fresh Hope group. Students in medical or psychological fields may occasionally participate in a Fresh Hope group as part of their studies. What Happens During a Fresh Hope Meeting? Meeting length is usually 90 minutes, consisting of Introductions, Large Group Topic Presentation, and Small Group times. Everyone starts together in the Large Group, then breaks into smaller groups, with the people with diagnoses in one part of the room, and the loved ones in the other. The large group meeting usually has a topic (i.e., Identifying Triggers”) Sharing as a large group is often helpful to everyone. Then when the smaller groups meet, they can talk more specifically about a similar problem, and how to prevent it, or at least handle it so there is minimal damage. We begin by introducing ourselves, identifying our diagnosis, and then sharing our ‘Mood’, ‘Hope Tank’, and ‘Clarity of Thinking’ status. (On a scale of 1-5 with 1 being low, how is your mood and your clarity of thinking? How full is your tank of hope? (Empty, half full, full tank) How is your clarity of thinking on a scale of 1-5 with 5 being sharp and clear?) Family and friends introduce themselves as a “loved one”. We then read the Fresh Hope Principles of Recovery (tenets) around the circle, or by reading by diagnosis / loved ones responses. Following this, the topic for the meeting is presented. Topics address the medical, physical, social, emotional, and spiritual areas of recovery. Once the topic is presented in Large Group time, small groups are formed by gender, diagnoses (Depression, Anxiety, Bipolar, Family, etc), and loved ones. This is a chance for everyone to share how their week has gone, and for further discussion on the topic of the meeting. 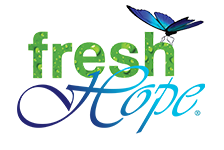 Attendance at Fresh Hope groups is free. Donations to help defray operating costs and supplies are greatly appreciated. Some groups have refreshments for fellowship before or after the meeting; some do this once a month. Groups regularly hold celebrations to acknowledge members’ perseverance and achievements. Hope Stones are often used to remember the milestone.